The woman standing next to me was standing next to me out of the same sheer curiously that compelled me to ask the question – that, indeed, compelled both Stephen and I to take a last-minute detour 130KM out of our way on this, our last day in Alberta, Canada. The Gopher Hole Museum and Gift Shop. June 2012. The woman standing next to me was Granny Gopher. The woman standing next to me could, in fact, be none other than Granny Gopher. We were in the presence of the Grand Matriarch of a little speck of a place known as Torrington, Alberta. A place you could not rightly call beautiful. A two-minute walk in any direction takes you to the very edge of town, will take you to that exact spot on the Albertan horizon where the sky and earth fuse into a vast, indistinguishable one. This has not in the least deterred the good people of Torrington, who decided to celebrate the awe and splendor of life in Torrington as they thought best. Through dead stuffed gophers to be exact. Because, unless yet despite being employed otherwise, gophers are a bane on the town of Torrington, destroying crops and leaving holes around town, attracting still more pests in the form of predatory badgers that dig still more holes in their pursuit of Torrington gopher meat. These holes can be dangerous. They can break legs: human, cattle and horse. They are unsightly and cause erosion. Torrington’s residents kill Torrington gophers by the thousands. Is the Gopher Hole Museum And Gift Shop world famous? True, when it opened its doors on June 1, 1996, there was a bit of what you could call a media frenzy – newspapers at home and abroad, including big name publications such as the Wall Street Journal and Newsweek ran stories of what could be called the Torrington’s embrace of its “controversial” museum. But now, as we trudge on toward the end 2013, it is fair to say that Things have died down for Torrington’s Gopher Hole Museum and Gift Shop. Publicity comes at a trickle, these days. That is how it went down. 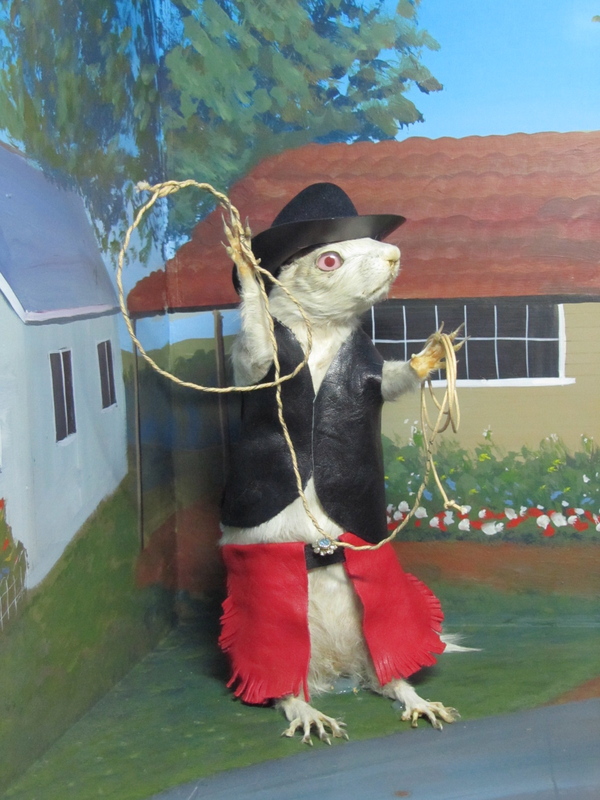 Is the Gopher Hole Museum And Gift Shop infamous? Again no. Not really, no. There was that scrap it had with P.E.T.A. 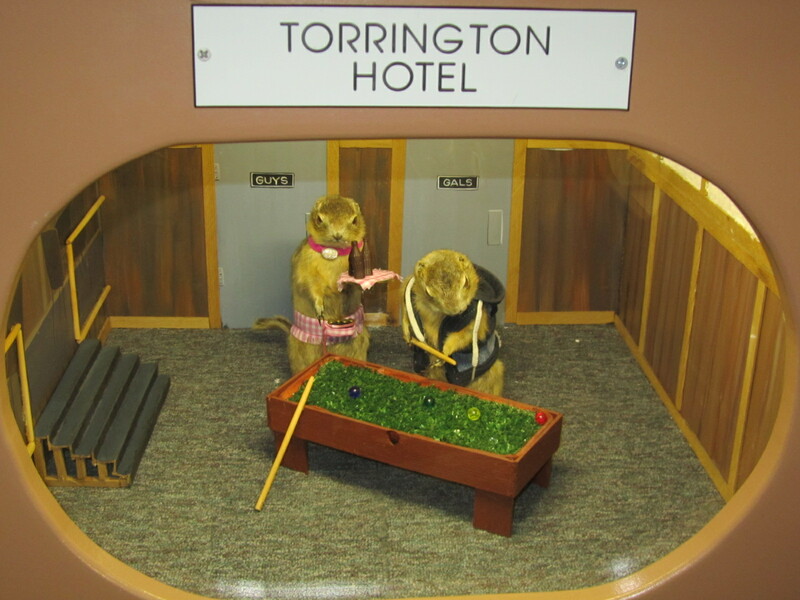 When Torrington settled on dead stuffed gophers to attract tourists, the People for the Ethical Treatment of Animals wrote many, many letters. It was a campaign of protest. Of indignation. Protest letters soon followed from all over Canada, France, The United States, the Netherlands, Germany and Japan. Eventually, Torrington sent a postcard to reply to P.E.T.A. “Get stuffed,” is what it said. 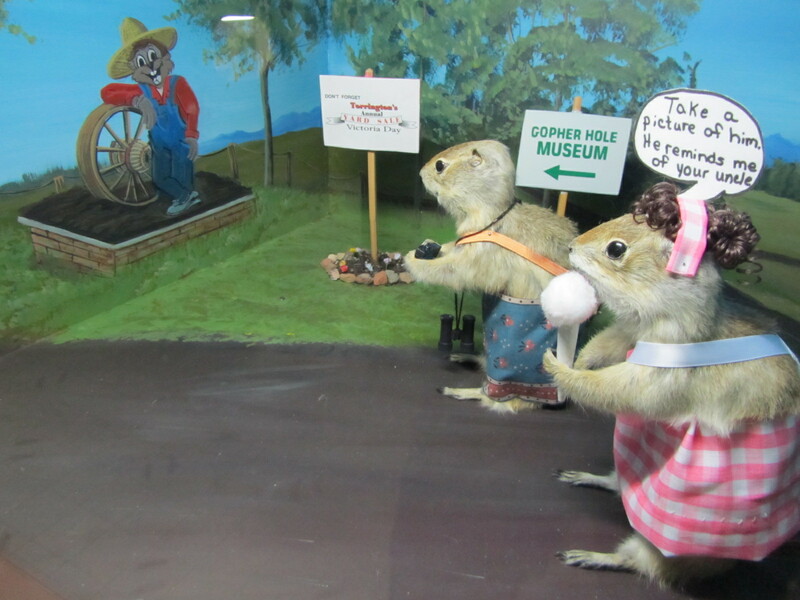 Inside Torrington’s Gopher Hole Museum And Gift Shop. “Television screens. The walls are full of little TVs”, is what I said to Stephen. I lied a little above when I said Things have died down for the Gopher Hole Museum and Gift Shop. There was a bus full of visitors due that day Stephen and I were there. That’s also why Granny Gopher was there, in person persona, dressed up and ready – to entertain half of the group (12 people) outside in order to allow the other half to comfortably tour the very small museum. In the gift shop, which you enter and exit during your visit to the Gopher Hole Museum and Gift Shop, is a map. It is dotted with hundreds of pins representing visitors from all over the world. 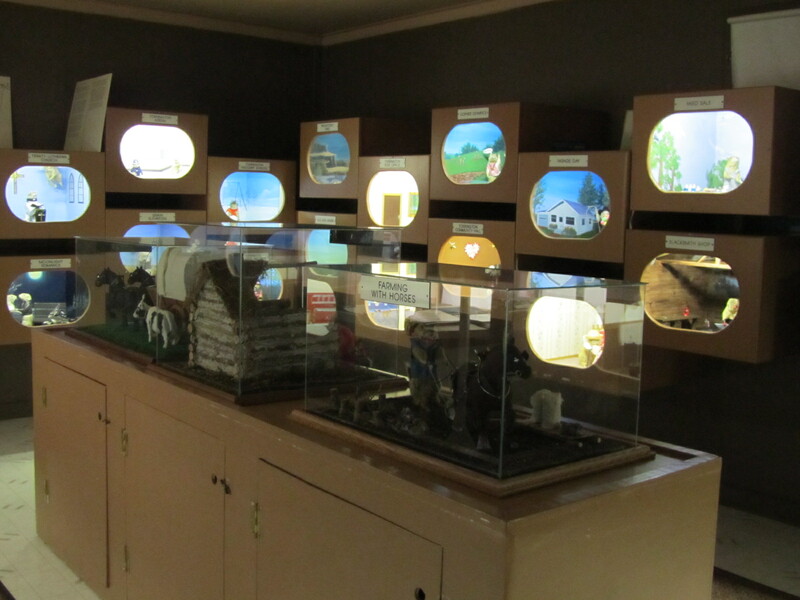 “Our museum is a whimsical portrayal of life in the tranquil hamlet of Torrington. 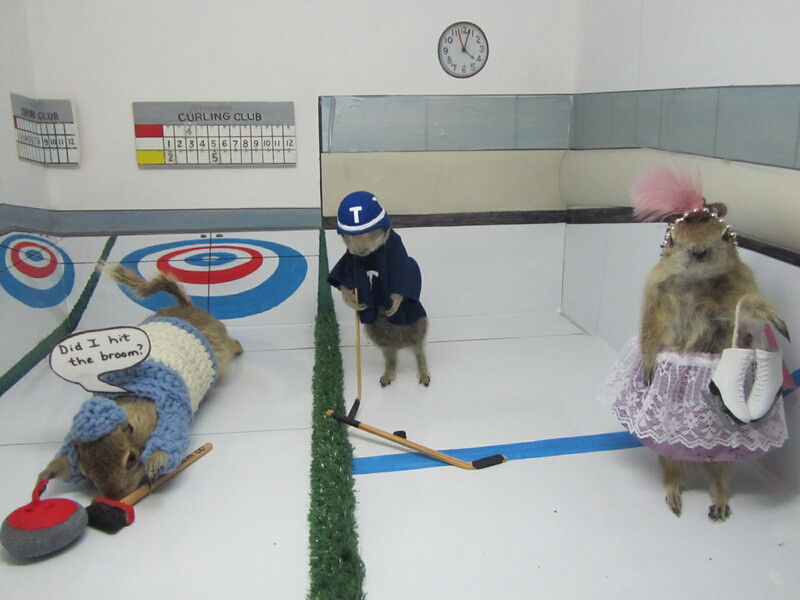 There are 77 mounted gophers in 47 displays with different themes: hockey player, hairdresser, farmer, etc. Each character is dressed to compliment the artist’s picturesque background”, reads a handout I was given at the Gopher Hole Museum And Gift Shop. The gophers, I am convinced, could have been depicted doing absolutely anything, anywhere. But almost all of the 47 TV boxes are of Torrington: the post office, the library, the Torrington Viscount School, Torrington’s Trinity Lutheran Church, Torrington’s Village Office, the Torrington Hotel and someplace called John’s Air Cooled Marine Engines Service. There is an unreal tangibility about the gophers of Torrington. Torrington’s gophers. Because the gophers are embedded into Torrington’s very concrete, in a way, they fill Torrington’s very air. There’s Clem T. GoFur, Torrington’s official greeter and town mascot. They dig their home in the prairie loam, turning everything to dust. Lots of us do like them, but their damage is not cheap. So just sit back and watch them as they dig up all our land. Torrington’s fire hydrants are painted up as gophers – Clem’s GoFur Clan – at the apex of which sits Granny Gopher of course. You may find each of hydrants – each member of the GoFur Clan – on a self-guided walking tour of Torrington using the very thoughtful map provided at the Gopher Hole Museum and Gift Shop by the TORRINGTON TOURISM ACTION SOCIETY. They have names and a pretty involved family tree, complete with individual back-stories. They are as real as it gets. “We don’t have an on-site taxidermist. There’s a man we send the gophers to. He stuffs them. Sometimes people send us gophers, like the albino one we have. The cowboy,” said Granny Gopher. Lacking lakes, mountains – natural attractions of any kind – without grand architecture or dramatic origins and bereft of anything you would call a vibrant arts or culture scene, Torrington looked deep into itself and came out the other side of itself. If it happens in Torrington, it happens to Torrington, it happens through Torrington. It had to have been always about the gophers. I have never encountered a place that meant itself so much as Torrington, Alberta. By Carol Pfeifer, a Torrington resident. 1. Granny is the matriarch of the GoFur clan, the mother of Trixie, Mabel and Junior. Her grandson, Clem, is the official town greeter. Granny and Gramps were among the earliest settlers of this region, at a time when becoming a province of Canada was still in Alberta’s future. 2. Gramps is the patriarch of the GoFur clan who is getting a little too old to cut the mustard anymore but he sill enjoys a bit of barley, He’s always happy to welcome visitors whenever they drop in to see him at the south end of town. 3. Auntie Mame is Granny’s sister who married an elderly European count and went to live in Gofalia when she was still in her teens. They lived happily in their castle for many years but then the count died, Auntie Mame returned to Torrington to be with her kinfolk. 4. Trixie is Clem’s mom and the daughter of Gramps and Granny. She is a nurse who cares for the sick and bandages the scraped knees of the youngsters in town. When Homer was inured falling from a hay wagon that was passing through town, it was Trixie who cared for him and when love blossomed, married him. 5. 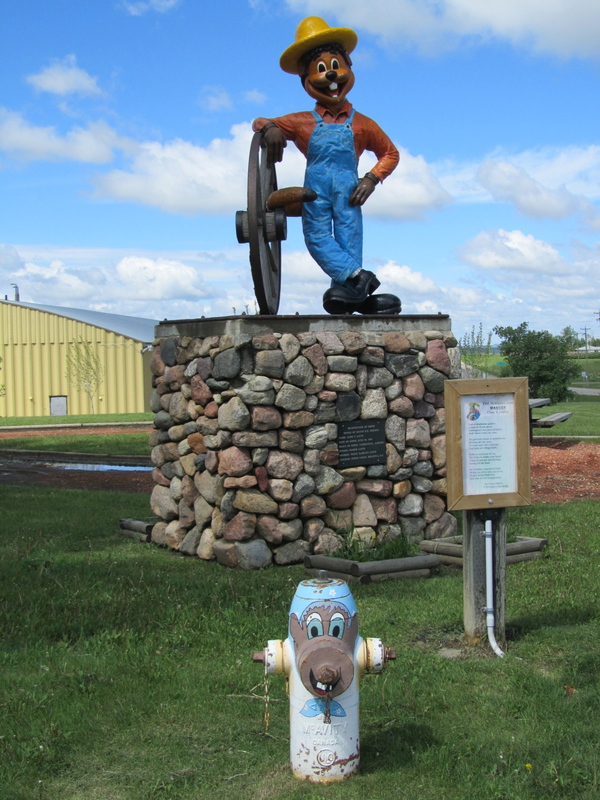 Homer grew up in Saskatchewan and arrived in Torrington when he fell from a hay wagon that was passing through town. Trixie found him at the roadside and cared for him while he recovered from his injuries. They later married and raised their children, Clem, Tubby and Peggy Sue, in the town. 6. Mabel was the town’s schoolteacher when she met Butch on a hoilday. She is very involved with community affairs and still teaches part-time at the school while also raising a family of little GoFurs. 7. Butch is the sailor of the GoFur clan. He was a crewman on a cruise ship when Mabel met him. After a long courtship, they married and Butch settled down in Torrington. Shy and retiring, he’s often found peeking out at visitors from behind the bushes and shrubbery. 8. Junior is the bachelor son of Granny and Gramps. He’s the musician of the GoFur clan and is the leader of his own musical group which provides music for many local events. During the winter, he travels in the south but if you’re lucky, you may find him at home during the summer. 9. Ellie May [mentioned only in entry on Baby Jessie. See below]. 10. Clem [mentioned only in entries of other GoFur family members]. 11. Tubby is the comedian of the GoFur clan. At family gatherings, he’s always the one with a lampshade on his head, surrounded by smiling faces. Tubby is the opposite of his rather quiet, subdued brother, Clem [,] who stands at the entrance of town, watching visitors as they pass by. 12. Peggy Sue is the baby sister of Torrington’s official greater, Clem. She’s normally found just outside the Lutheran Church, dressed in her ‘Sunday best’, as she leaves church after attending Sunday School. 13. Baby Jessie is the daughter of Clem and Ellie May. She used to enjoy watching the trains that passed through Torrington. Now, even though the line has been closed and the track removed, she still likes to sit and remember those good times. 14. Clem Jr. is the “chip off the old block” who tries to imitate his father, Clem, in every way. You’ll notice that they even dress alike. When he grows up, he thinks he’d like to be a fireman. He likes to play on the swing and slide in the playground.